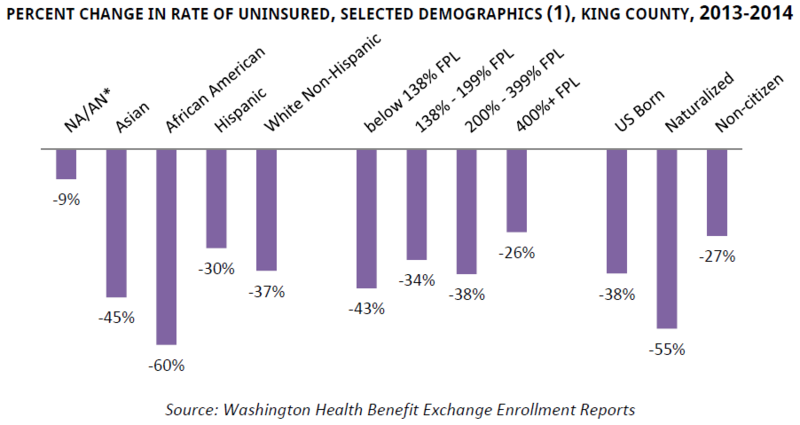 Of particular note: disproportionate drops in the rate of uninsured occurred among African Americans, Asian Americans, people with incomes below 138% of federal poverty level, the unemployed, and naturalized citizens. These numbers indicate the success of the Affordable Care Act across all population cohorts, while highlighting those cohorts which still disproportionately lack health coverage. 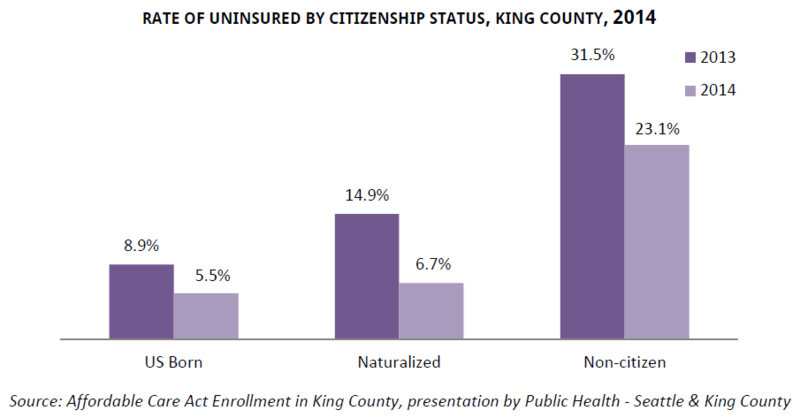 In spite of the advances in coverage made possible through the Affordable Care Act, 139,000 residents of King County still did not have health insurance as of 2014. [v] These individuals are particularly concentrated among adults not in the labor force (35,546), non-citizens, those who with incomes below the median income (112,040), Hispanics (35,785), and people between the ages of 25 and 45 (75,233). These are overlapping cohorts. For example, thousands of Hispanics reside and work in Washington state are both poor and do not yet have citizenship status. 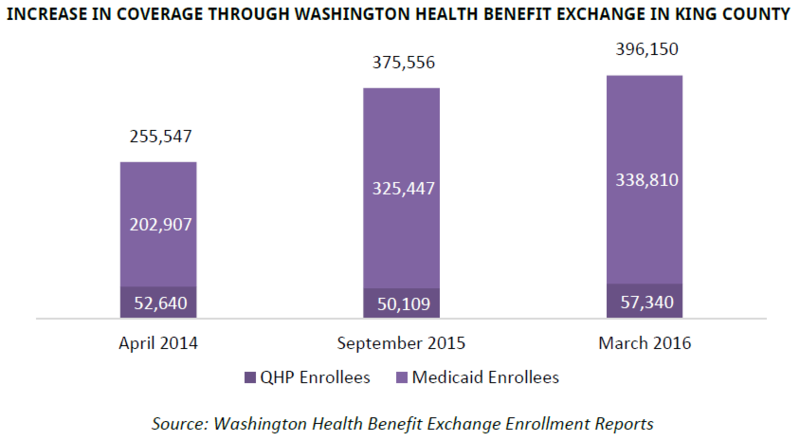 It is important to note that since 2014, over 140,000 additional people have gained health coverage through Apple Health or the Health Benefit Exchange (an additional 60% on top of 2014’s totals). At the same time, King County’s overall population has grown by 89,000 people. 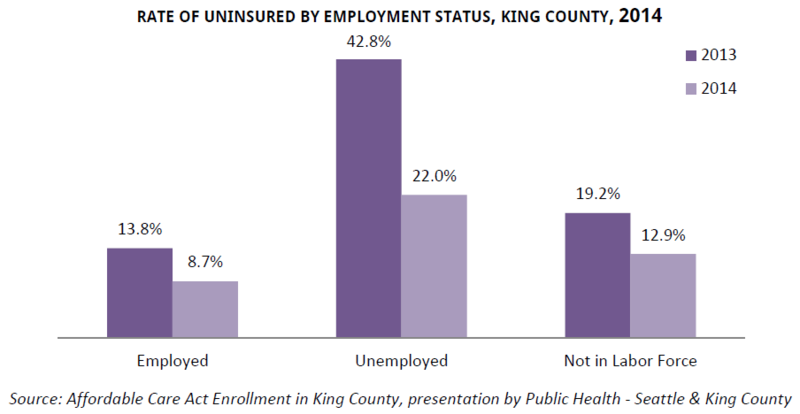 Without knowing the numbers of employees who have been switched from employer health coverage to coverage through the Health Benefit Exchange, we can only imprecisely estimate the number of residents who remain uninsured in King County. 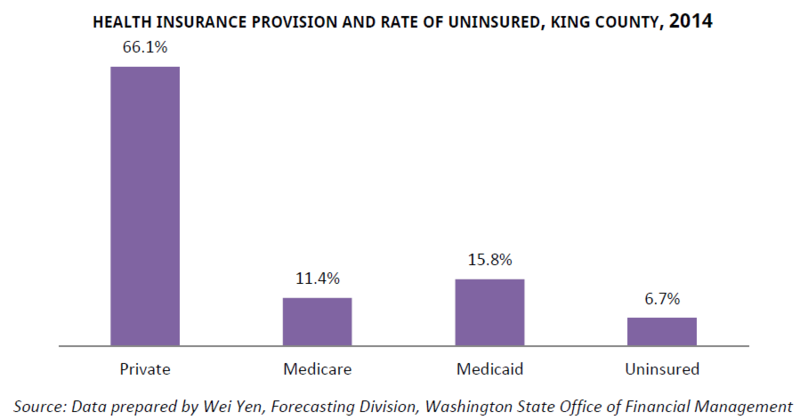 Our estimate is that of the 2.1 million residents of King County, fewer than 80,000 people, or less than 4% of the County’s population, lack health coverage. A decrease in the number of uninsured does not mean the Affordable Care Act has “solved” problems with the nation’s health insurance coverage. Current coverage rates still don’t match the levels found in other developed countries around the world. 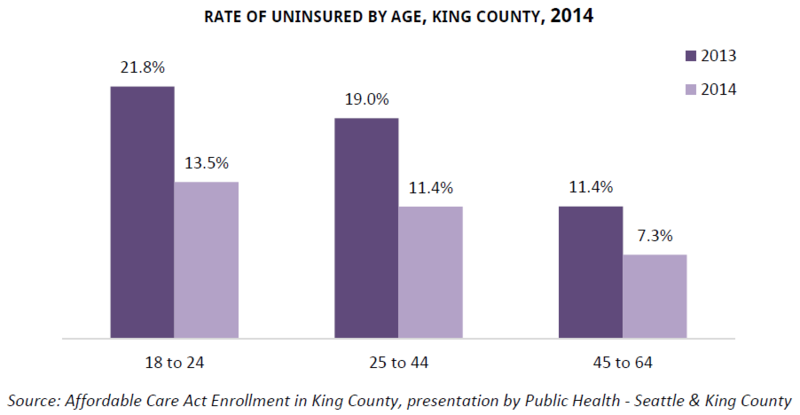 And even King County residents who have health insurance remain vulnerable to losing coverage or being financially unable to meet their “cost-share” for health coverage. Imagine a hypothetical community college student named Brenda, who is working 32 hours a week at the minimum wage in Burien. At $9.47/hour, her income is $14,773 and she qualifies for Apple Health (i.e. no-cost health insurance.) The following year, she takes a job in Seattle that pays $12.50/hour. Her income goes up to $20,800, a bit above 175% of federal poverty level. Brenda now no longer qualifies for Apple Health, and so moves into the commercial health benefit exchange. While premiums and out-of-pocket costs are subsidized by the federal government, they can still be sizeable. If she gets ill and needs care, she can lose 40% of the increase in her wages – over $2,300 – to payments for her health insurance coverage. If her income increases to $29,500, she could pay as much as $6,152 for health care in premiums and out-of-pockets costs – more than 20% of her total income. 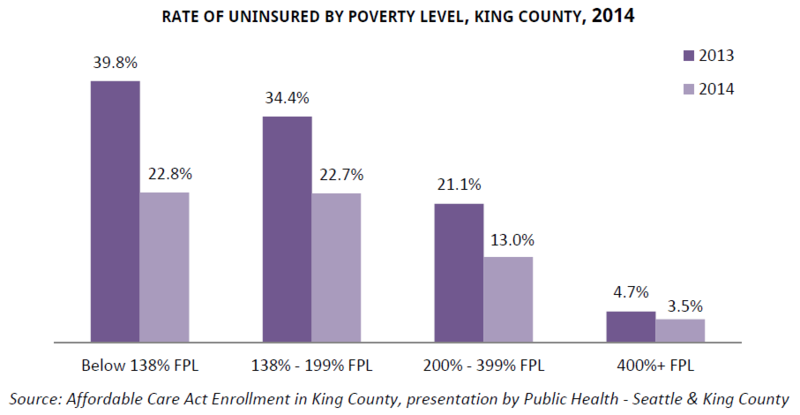 King County can improve health insurance coverage by paying particular attention to those populations with continued high rates of uninsurance and underinsurance – that is, individuals below 138% of federal poverty level (who qualify for Apple Health but may have difficulty accessing it), and those between 138% and 199% of federal poverty level. For people in the former category, that corresponds to: less than $16,284 for a single person; less than $22,107 for a two-person family; less than $27,820 for a three-person family; less than $33,534 for a four-person family; and less than $39,247 for a five-person family. The county should make every effort to expedite coverage for this population through Apple Health, while recognizing that many residents and workers at this income level will still not be able to gain coverage due to citizenship status. For those with incomes between 138% and 300% of federal poverty level, there is not a straightforward solution regarding affordability – particularly for premiums and out-of-pocket costs that challenge family budgets. One avenue is for the county to explore re-instituting Washington state’s Basic Health Plan at the county level, using the same parameters for cost-sharing that were in place when the people passed Initiative 773 in 2001 to expand Basic Health coverage. The county could also work with the state and federal government to increase the threshold for coverage under Apple Health from 138% to 150% of federal poverty level. If this were to happen, about 13,000 people currently in the commercial exchange could move into Apple Health. [viii] Another possibility is for the county to work with the state in developing a federal Basic Health option, as provided by the Affordable Care Act’s section 1331. King County, Washington state, and the United States have embarked upon systemic and significant advances toward achieving health coverage for all. While progress has been made, there is much more to do. This work will take innovative and creative policy development, increased public funding, and, most importantly, the political will to meet the health needs of and establish health security for all residents. [ii] Population grew in King County from 1,981,900 to 2,052,800 between 2013 and 2015, an increase of 70,900, or 3.58%. See http://www.ofm.wa.gov/pop/asr/default.asp Washington state Office of Financial Management, Population, Estimates of April 1st population, county data tables. [iii] The OFM data is for the total population (that is, including Medicare recipients 65 and older, and children under 18 years old, whose coverage is very high, thanks in large part to Apple Health. The King County data focuses on the 18-64 age population. Further, OFM adjusted data to take in account an undercount of Apple Health enrollment in the 2014 American Community Survey (ACS). 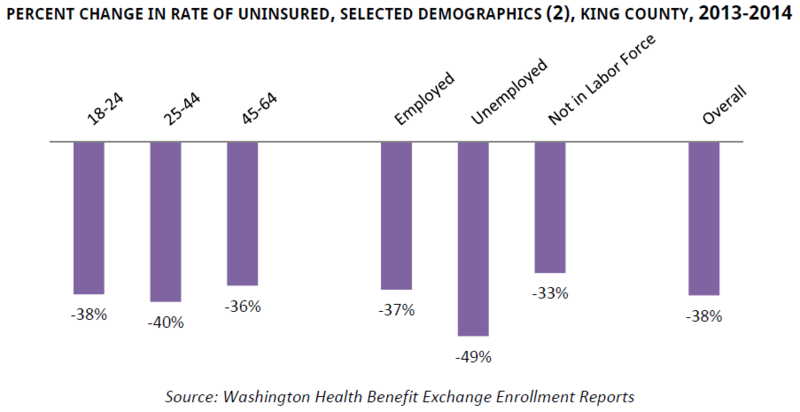 These differing methodologies and populations account for the difference in the rates of uninsured. 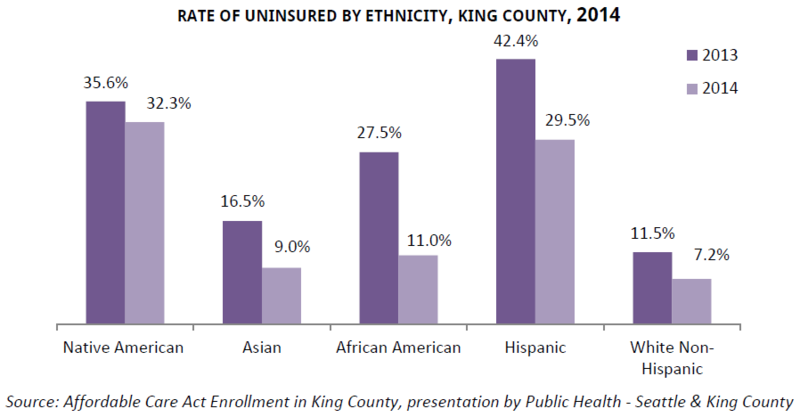 [iv] Affordable Care Act Enrollment in King County, presentation by Public Health – Seattle & King County, http://www.kingcounty.gov/healthservices/health/%7e/media/health/publichealth/documents/data/affordable-care-act-enrollment-king-county.ashx, p. 10 and 11.